My works on paper and sculptural installations are inspired by traditions implemented by religion, culture and social anxieties within my family’s Pakistani community. Currently I am focusing on a series inspired by memories from my childhood in which I use outlines and silhouettes from childhood photographs of myself. While I equally analyze social and cultural customs of my family & religion, I trace back to my childhood to discover violence of the body. In my proposed work, I declare war on the issues within a family structure that are hidden and are considered taboo to vocalize, specifically sexual violence. The work will be suspended and made of graphite, watercolor, gouache, ink and gold leaf on Japanese paper. 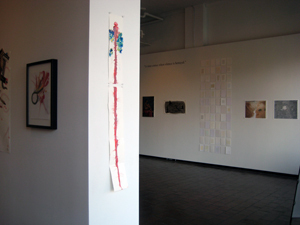 The work is a scene of a massacre and illustrates a visceral experience of fluids escaping and exploding from the body. The main figures are anonymous, sometimes beheaded. My work retraces and recollects memories that have physically and socially been erased but challenges the viewers’ perceptions of exhibitionism and sexuality.